The Riebeek Valley was first visited in 1661 by Pieter Cruythoff and Pieter van Meerhof on an expedition looking for the fabled city of Monomotapa. Cruythoff named it Riebeek’s Casteel after his Governor, Jan van Riebeeck. This mountain chain, rising like an island out of the Swartland to 966m above sea level, is a fynbos paradise. The Mountain forms part of the Table Mountain sandstone group and there is a clear fault line in the earth's crust running west of the mountains to the Atlantic Ocean. ​established an early triangulation system, at least part of which is still in use today. A spot on the Kasteelberg was a key point. Following the plotting of stars, he concluded that the Earth had a larger radius south of the equator. This caused quite a stir at the time, but he was wrong. He failed to allow for the magnetic fields of the mountains as ascertained by George Everest. In 1839 Sir Thomas Maclear, of the Royal Observatory in Cape Town, climbed Kasteelberg, and took further measurements which enabled him to correct de la Caille's earlier findings. The two towns Riebeek Kasteel and Riebeek West were established in the mid 19th century as a result of a congregational fight. Riebeek West formed its own congregation in 1858 and Riebeek Kasteel in 1861. In olden days Riebeek Kasteel was referred to as "Mossienes" and Riebeek West as “Vinknes". 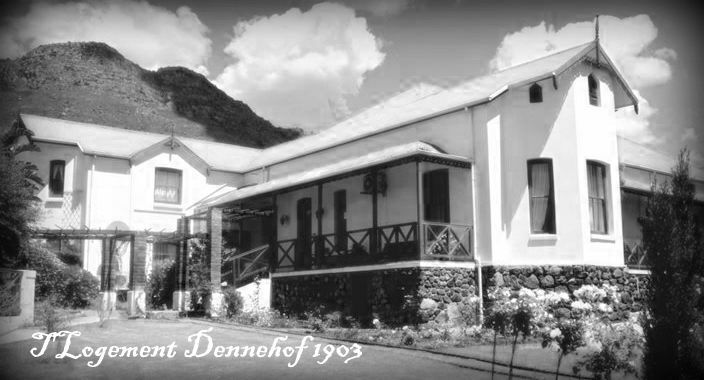 ​During 1917-18, the Dutch Reformed Church bought the building to be used as a School of Domestic Science. In 1990 retired Prof J Potgieter from University of Fort Hare bought the property and he and his wife, Lynette, spend a vast amount of money on renovating the building. Four owners later, the building eventually become a luxury 4-star Hotel with 28 double en-suite rooms (8 not graded) and 3 conference/functions rooms, private swimming pool as well as an organic pool. Several solar panels for hot water were also installed. Riebeek West is unique in that two famous South African politicians were born here. In 1870 politician Field Marshal and philosopher, Jan Smuts was born on the farm Ongegund. A barn and the farm was then converted into a house when Jan Smuts parents were married. This barn still exists, but the farmhouse not. The site is now owned by PPC and the house is a museum. Four years later, South African Prime Minister, Dr DF Malan, was born at Allesverloren. The farm is still owned by the Malan family. ​One of two comparable towns lying in the stunning Riebeek Valley - Riebeek West and Riebeek Kasteel - with views that have had many a day tripper making rash decisions to relocate, Riebeek West might be regarded as the Cinderella of the two, but has its own draw cards - beautiful old Victorian houses, peace and quiet, and easy access to local vineyards. The Valley has become the mecca of artists, alternate life-stylers and young self-sufficient professionals who work from home and commute to Cape Town, which is only an hour away. This is the scene of rolling hills, vineyards, olive groves and wheat fields, where an annual olive festival and a vibrant community have added to the town’s appeal and predictably resulted in estate agents calling it ‘the new Franschhoek’. The imposing mountain, after which the valley is named, was called Riebeek’s Kasteel way back in 1661, in honour of the then governor of the Cape. Already stated at the beginning Huguenots (?) settled here and inevitably planted vineyards in what is still a wine growing region today, whilst wealthier farmers retired in Riebeek West. Riebeek West is all about a laid-back way of life, bread, olives and, wine. A slightly bohemian atmosphere has only contributed to the valley’s appeal. That, and the tranquil existence that offers an unhurried pace and a place to get away; to slow down. weddings, conferencing and price structures. rvhotel@netactive.co.za | +27 22 461 2672 | manager.rvhotel@gmail.com.